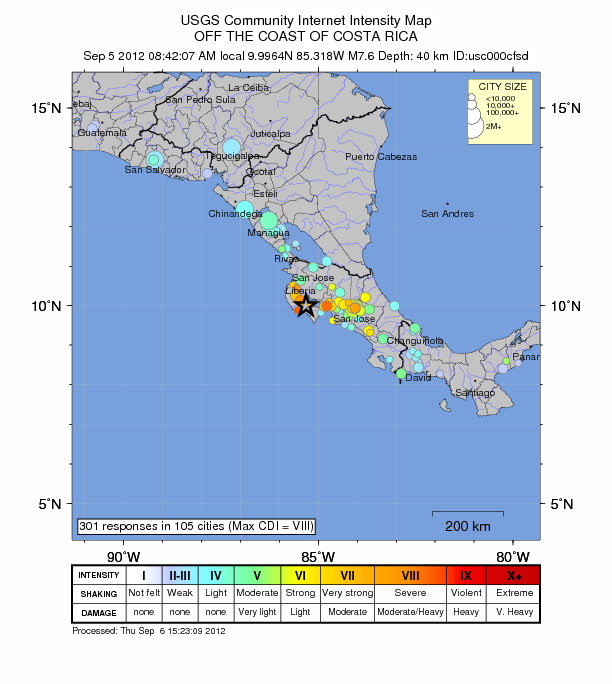 On Wednesday 5 September 2012 at 8:42 a.m.local time, a M7.6 relatively shallow earthquake hit near the town of Hojancha in the Nicoya Peninsula on the Pacific coastline of Costa Rica. Several aftershocks of lesser magnitude, but at least 4 of M4.5 or higher, have followed over the course of the last 24 hours. The quake was strong enough to have been felt from the Cosiguina (Gulf of Fonseca) region in northwestern Nicaragua, to the city of David and farther south in Panama, a stretch of more than 1,000 kilometers. The initial quake and the proximity of its epicenter to the Pacific coastline triggered a Tsunami alert from Panama to Nicaragua. Communications went down right after the initial strong shock and power was off over a vast region of Costa Rica, including the Central Valley where the capital city of San Jose and other large population centers are located, from 4 to 5 hours making it difficult to obtain direct information about damage from the quake. San Jose is located approximately 150 kilometers to the East of the epicenter of the earthquake. I was able to communicate with contacts in neighboring Nicaragua about one hour after the M7.6 quake and obtain some additional information about the impact, and a damage report from that country. I was already making arrangements to use amateur radio to try and connect with contacts in Costa Rica when I was able to finally make contact, via cell phone and social media, with relatives in San Jose at 11:45 a.m. local time or about 3 hours after the initial quake. An initial damage report form San Jose, Costa Rica, showed at least two deaths attributed to the quake, strong shaking during the first seismic impact causing multistory buildings to sway strongly, minor cracks on walls, and objects to fall off shelves, but no significant structural damage to buildings or residences. In addition, the electric power grid went down, as well as the land-line telephone system, while the cellular system continued to operate, but was quickly overwhelmed by the volume of calls. Because the hour of the earthquake coincided with morning-time work and school traffic, this and the lack of power resulted in chaotic driving conditions. Panic and frustration among the general population was widespread. By the time I was able to make contact, the tsunami alert had been lifted already. So, what is going on with this seismic activity in Costa Rica? This M7.6 and its aftershocks all took place in the Caribbean Tectonic Plate near the Central American Trench where the Cocos Plate subducts under the Caribbean Plate at a rate of 75 to 80 mm/year. 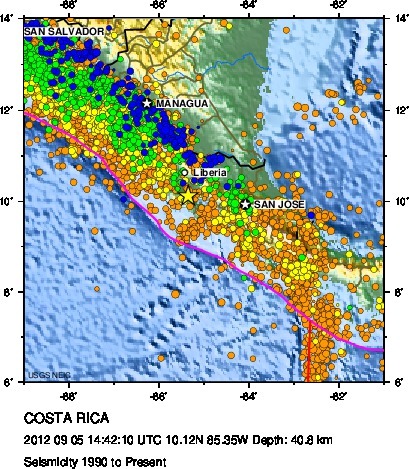 So, in order to put this recent seismic activity of 5 September 2012 in Costa Rica in some form of context, I propose to take a closer look at what has been happening in the Caribbean Plate recently. 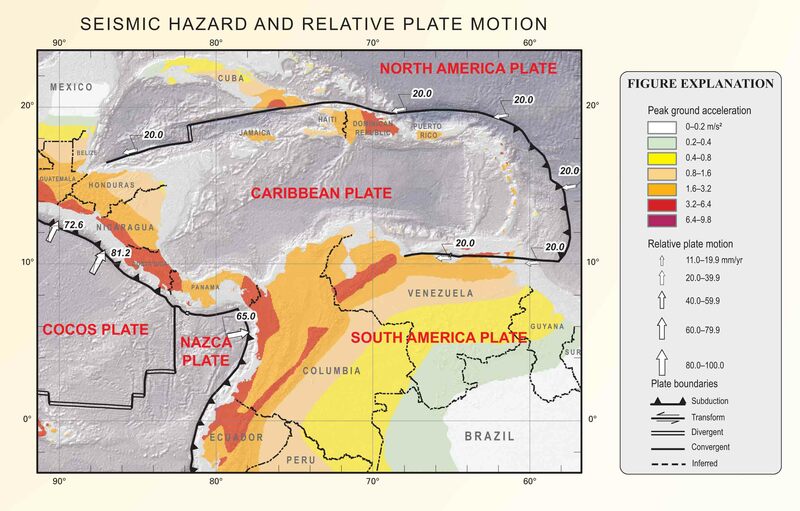 The Caribbean Plate is located at the confluence of five tectonic plates in a region that borders the well-known Pacific Rim of Fire, where there is constant and complex interaction between the several plates. because of such ongoing process of plate interactivity, the Caribbean Plate has a history of vulcanism and seismic activity going back thousands of years that continues today. The Caribbean Plate encompasses almost the totality of Guatemala, Honduras, El Salvador, Nicaragua, Costa Rica, Panama, Jamaica, the Island of Hispaniola (Haiti and the Dominican Republic), Puerto Rico, The U.S. and the British Virgin Islands, and the Lesser Antilles, as well as most of the Caribbean Sea. By reviewing records of earthquakes kept by the Earthquake center of the U.S. Geologic Survey (USGS), which list all earthquakes of magnitude M2.5 or higher taking place worldwide I discovered that during a 130 hour period from 31 August 2012 through 5 September 2012 there were a total of 484 earthquakes M2.5 or higher worldwide, and of these just above 30% of 146 hit in the Caribbean Plate. This is indeed a high rate of seismicity specially when we take into account the areas (spatial extent) involved. Based on the epicenter coordinates for each of these earthquakes we can see that most of this recent activity has taken place along the northeastern end of the Caribbean Plate, around Puerto Rico and the Virgin Islands, but a total of nine countries or their territorial waters have been hit by at least one of these earthquakes during the period in question. The 130 hour period used for the tables above is really only a snapshot of the earthquake activity that goes on in the Caribbean Plate. 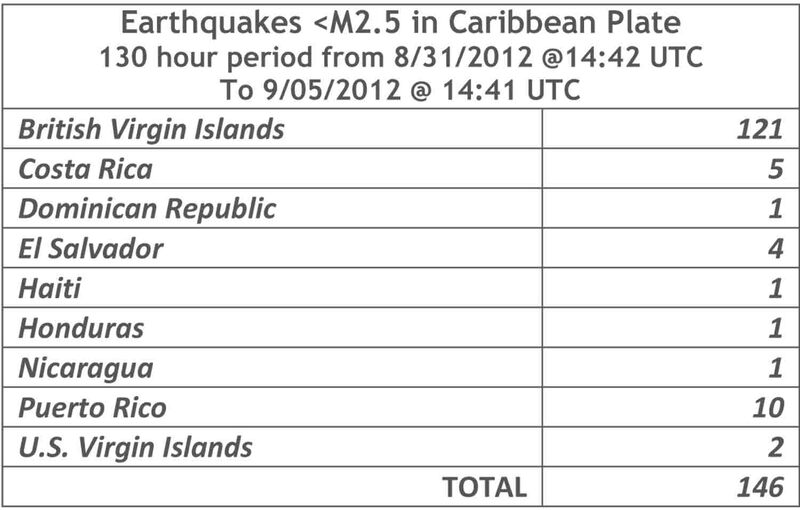 Clearly such seismic activity continues, and in fact in the additional 100 hours since the end of the period covered by these tables to the late evening (UTC) on 9 September 2012 , as I write this notes, the USGS record already lists 70 additional earthquakes M2.5 of higher that have hit somewhere in the Caribbean Plate, including several aftershocks in the same region of Costa Rica hit by the M7.6 on 5 September. So there have been a total of 216 earthquakes of M2.5 or higher in a period of 240 hours, or pretty close to one an hour. A lot of shaking indeed, specially when we realize there are many times that number if we were to include earthquakes below magnitude 2.5. Such lower magnitude earthquakes are not normally included in these records, because most of them are so weak that they are not even felt by humans and cause no noticeable damage to buildings and infrastructure. Coincidentally perhaps, the pattern of seismic activity in the Caribbean Plate bears some similarity to what took place toward the end of 2009 and early in 2010 before the January 2010 M7.0 earthquake that devastated western Haiti, including its capital city of Port-au-Prince. During that episode of seismic activity most earthquake events took place around Puerto Rco and the Virgin Islands, with some hits in or near the coasts of Nicaragua, el Salvador and Costa Rica, and additional events off the coast of Honduras and then in the Island of Hispaniola. From this we may conclude that earthquake activity in the Caribbean Plate is the norm rather than the exception, and we should not be surprised if new seismic events continue to take place in this region. Because some of the neighboring plates are subducting beneath the Caribbean Plate along its western border, along the central American Trench, but also along its northeastern and portions of its eastern borders with the Atlantic, there has been a long episode of mountain building and vulcanism, which is evident today as a long chain of volcanoes near the Pacific coast line stretching from Guatemala to Costa Rica and Panama, as well as mountain ranges and abrupt topography in Jamaica, Hispaniola, Puerto Rico and in the Virgin Islands. One of the many volcanoes product of such plate tectonic processes, Volcano San Cristobal, in Nicaragua has entered quite an active eruptive phase over the past few days that has prompted the evacuation of thousands of residents in the provinces of Chinandega and Leon in Nicaragua and a state of emergency issued by the Government of Nicaragua. San Cristobal with a height of 1745 mt (5725+ ft) is the tallest volcano in Nicaragua, and it has been active since 1525. This volcano is the youngest of a complex of five volcanic edifices, which originated in the Pleistocene. Just a few kilometer to the west of San Cristobal, on the extreme northwestern point of Nicaragua along the Pacific coastal plain, we find what remains of Volcano Cosiguina now 900 mt high, which in 1835 had an explosive eruption that blew its top 700 meters off and rivaled that of Krakatau in Indonesia. Ash and ejecta material from the 1835 eruption have been found as far away a Jamaica and Costa Rica, and it was so voluminous that it altered the global climate and specially so in Nicaragua, where 1835 was subsequently known as the year of the smoke! In closing it is important to answer the question many are asking, specially in Nicaragua, regarding whether the eruption of San Cristobal and the M7.6 earthquake and subsequent aftershocks in Costa Rica are related coming, as they have just a couple of days apart from one another? While no one can say that the volcanic eruption in Nicaragua was triggered by the earthquake activity in Costa Rica, what is certain is that both events are byproducts of the ongoing natural process of plate tectonics involving the Caribbean Plate and its interaction with The Cocos, Nazca, South American and North American plates, and related sub-processes of subduction, faulting, vulcanism etc. 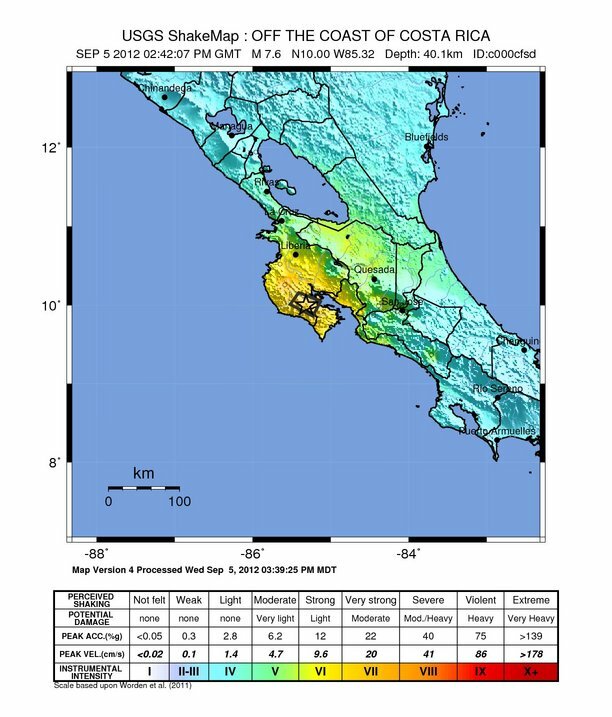 As I am about to place the final period in this article, I am receiving reports of currently ongoing rather mild earthquake activity just northwest of Managua, in the peninsula of Chiltepe in Lake Xolotlan (Managua), where the remnants craters of ancient volcanoes are part of the striking landscape near the capital city of Nicaragua. While this earthquake swarm near Managua has only reached magnitudes of M1.5 to M2.0, it is nevertheless evidence on the continuous process that makes the Caribbean Plate and all countries on it so vulnerable to earthquake and/or volcanic activity.